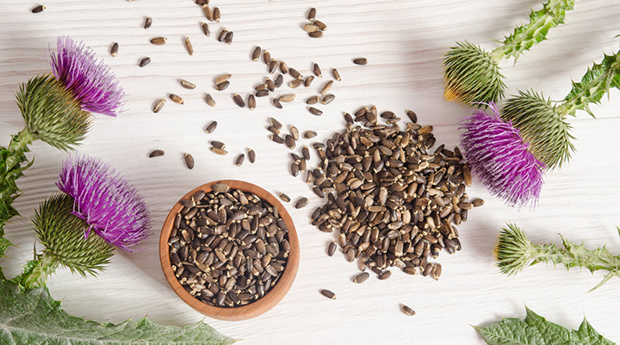 Milk thistle can be taken as a powder or liquid extract, or in tablet or capsule form. 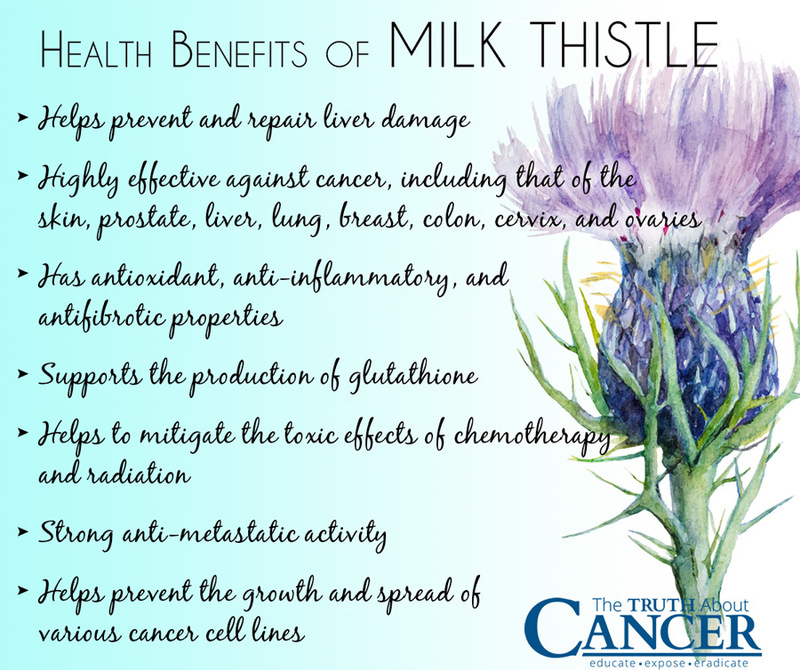 Both powdered milk thistle and milk thistle seeds can be brewed into a tea. However, many of the healing compounds found in the plant’s seeds are not easily steeped into hot water. This is why some health practitioners recommend eating the seeds whole or grinding them up and adding them to food or drink. While there’s no official standard for a therapeutic milk thistle dosage, typical usage amounts range from anywhere between 140 milligrams (for mild conditions like seasonal allergies) to 600 milligrams (for more serious health conditions) of silymarin. This should be divided into two or three doses taken throughout the day. Milk thistle side effects are generally mild, and both animal and human studies have shown the herb to be generally non-toxic. But taking higher doses can result in upset stomach and diarrhea. This is due to increased bile secretion and flow, which can also result in a laxative effect. Health authorities advise against pregnant and breastfeeding women using silymarin. If you’re allergic to ragweed, yarrow, daisies, chamomile, chrysanthemums, or marigolds, you should also avoid taking this powerful herb. I have read that milk thistle has estrogenic properties, which if thats true, would probably not make it beneficial for hormone positive breast cancer? Can someone please clarify on this, is it true? My mother has breast cancer with mets to liver and bone, i would love to have her try milk thistle for the liver but I don’t want it to feed her breast cancer or have a negative impact. calif doctors were Very supportive of using Milk Thistle. Cindy, my wife and I had candida along with HPV virus. We went to a naturalist (no pharma) and got hydrogen peroxide IV. Six treatments each 1/2 liter over two weeks and the HPV and candida were GONE. I now do singular treatments regularly 3-4 times/year to kill any virus including cancer. It’s call “oxidation therapy” and is easily researched on line. 80-100 years ago it was quite common before big pharma took over. It works and it’s cheap. Do your research and God bless. I have to agree with Josephine M (Hong Kong). It is too much information too quickly. I cannot absorb the amount of info coming in so quickly. I appreciate the effort that is put into the research and the fact that it is an expensive exercise, but as a pensioner, I cannot afford a lot of the products you recommend. There are so many. Also, I am not in the US, so that makes it more expensive again. Apart from that, you are doing a wonderful job. Keep it up. What about making Rick Simpson oil. You need alcohol as a solvent . Right? Dealing with CLL. Any other good ideas other than cannabis oil? I’m curious, what is the best solvent? Is there no herb that is best taken in an alcohol extract? Not even if it’s organic biodynamic grape alcohol? I was under the impression that alcohol extracts were the most potent and best preserved. I was healed earlier this year (10/8), and it was simple and free. There is one thing that always heals and never fails: Love. It’s simple like this: God is love. His word is love. His word (literally) brings healing to every part of our body. Yes LORD!!!!! THE BEST advice ever given! I am directing this question to Cindy May or anyone that can give me help concerning candida. I have been taking medication from doctors for many years and continue to have problems with candida. However, about a year ago I changed my diet and have been taking oregano oil and total off sugars which have helped so very much. To you all know anything else available that would be helpful with candida? Thanks so much for your help. I have used the sap of the milk whistle that grows as a weed around us to treat a basal cell carsenoma, after two treatments over a period of two weeks it has gone. There is no scar or sign of this nasty cancerous growth. I have had one cut out of my back, two from my forehead and a very painful one in December from my nose with 20 stitches. Another appeared on my forehead so it is currently under the milk thistle treatment. I love herbs. The sun has taken its toll.